Google’s Chrome web browser has surpassed the 25 percent browser market share milestone, jumping 0.69 percentage points to finish at 25.68 percent according to the latest numbers from web analytics firm Net Applications. What's funny about these numbers is that they are very far off from other measurements by competing firms. According to StatCounter, Chrome is not only the most popular mobile browser without tablets but also with them counted in. 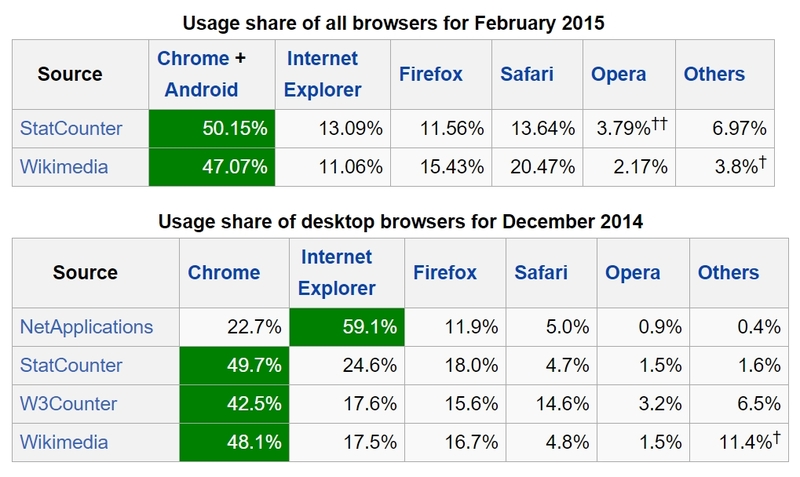 StatCounter stats had Chrome surpassing the 50% share of the desktop browser market last January. 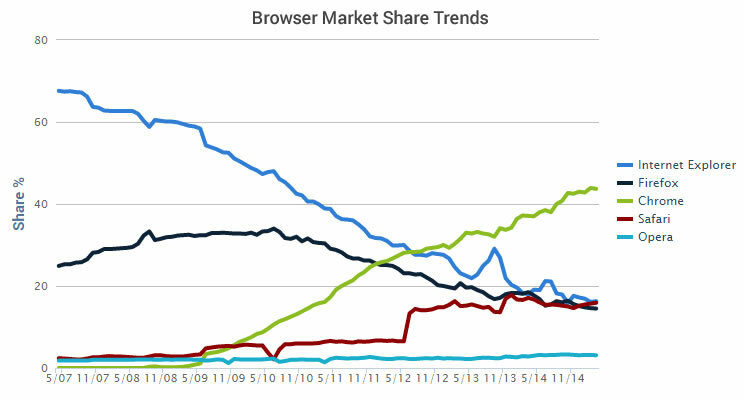 Internet Explorer continues to be drop in usage while Mozilla’s Firefox usually ranks second when looking at desktop PCs, and third when looking at all devices (mobile, tablet, desktop) behind Chrome + Android and Safari (OS X and iOS). Last week was big for Microsoft as it finally gave Project Spartan an official name, Microsoft Edge. Based on what we’ve seen of the browser thus far, it looks to be a solid solution with a fresh new look, deep Cortana integration and some nifty new features like annotation and Reading Mode. IE11 in particular is not bad, and Edge will be based on some of its technology, but Microsoft cleverly has dropped the IE name and is looking to start off fresh. How it’ll actually handle day-to-day web surfing, however, will likely be the deciding factor for most. Irrespective of the stats it is the most popular browser but a little RAM heavy. Unity 3D, the 3D engine, not the game, might stop working on chrome. That's an understatement. You have no idea how many times I've run out of physical memory due to Chrome. It regularly uses 14+GB. Honestly, I think Firefox is lighter at this point. I don't understand that graph. 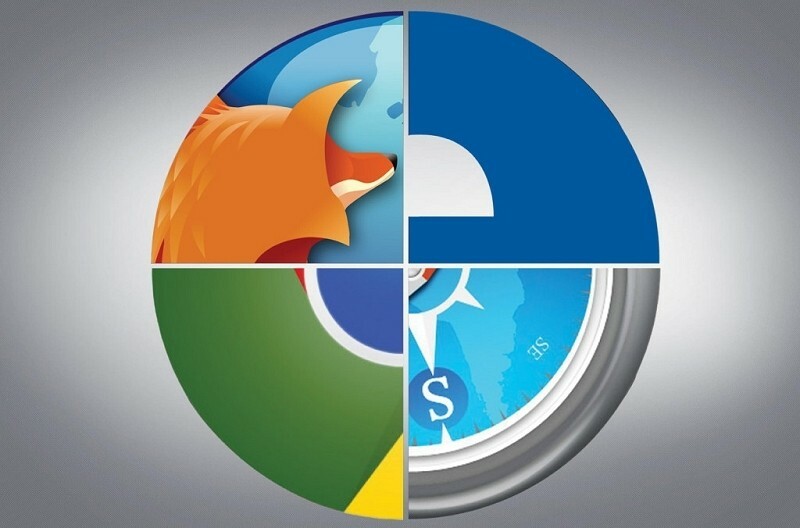 it has spikes in it at different times for some of the browsers where usage increased quickly. What are those? There isn't a corresponding decrease in another browser, so does that represent a large group of people who just got turned on to the internet? That's going to happen if you have tons of open tabs. On an unrelated note it appears the IP hosting Techspot has been black listed by PeerBlock, had to make an exception for it, this must be as of this weekend when PeerBlock last updated because it was working fine the other day. It's kind of annoying how Chrome doesn't consolidate the tabs into one application in Task Manager, three tabs open currently but that requires 8 task? Firefox with the same three tabs is a single process, figures, it's also using less RAM. That was meant as a feature, since back when Chrome 1.0 was released. It's so that if one tab crashes, it (theoretically) shouldn't compromise the others. Personally, though, I've never had this fabled one-tab crash, only regular take-everything-down-with-me crashes. Statics accuracy may vary, depending on who you ask. That's why I hate articles that don't state the origin source. No, not "according to IDC", the study or materials they derived their results from. If they can't even show you that, it's worth about as much weight as anyone else's. I was also thinking if one tab need to be forced closed you could do so in task manager, but all the task have the same name, so good luck closing the right one. But that does kind of make sense in a stability point of view. I still use IE on Windows 8.1 - I've used Chrome before and didn't like it, and I haven't noticed a difference with Firefox other than FF was faster when I used the PCs at school. I use Chrome on Android though for it's data compression feature. That doesn't justify the behavior. Besides, Firefox can handle probably over 4x the tabs I open in chrome without stretching past 7 or 8GB of mem. A result of it spawning tons of extra processes, but I see that as a good thing because FF refuses to use more than 25% of my quad core cpu before freezing and not responding, while Chrome is happy to use ~80% to stay responsive. What you loose on the swings you gain on the round-a-bouts. The memory usage doesn't bother me, I'm not the type of person to open hundreds of tabs and when I've finished with them I close them.